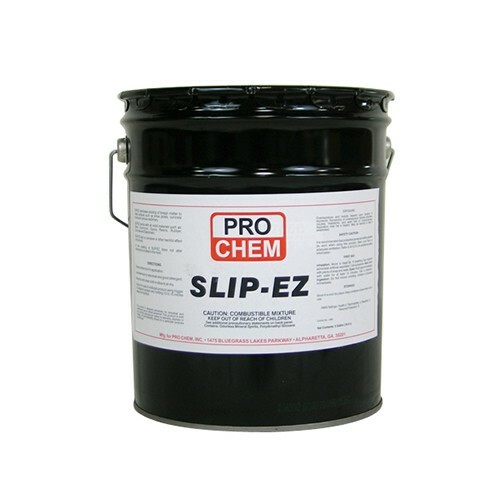 SLIP-EZ BULK | Pro Chem, Inc.
SLIP-EZ Bulk is an oil-based silicone lubricant that is an excellent release agent for use with all mold materials such as steel, aluminum, epoxy resins, rubber, concrete and elastomers. It has no corrosive or other harmful effect on the mold. This product provides a thin coating that will not degrade the quality of the concrete or asphalt, yet provides a surface that it will not stick to. Clean surface prior to application. Use steel wool or wire brush and good detergent. Wipe dry with clean cloth or allow to air dry. Spray thin coat of undiluted product using trigger or pressure sprayer and holding 10-15 inches away from surface.